pastors | When I Survey . . . I was ordained to the Christian ministry on this day in 1975 at the Newton Highlands Congregational Church (UCC) in Newton Highlands, Massachusetts, by the Metropolitan Boston Association of the United Church of Christ. Dudne Breeze, the pastor, preached the sermon, and a good one it was. Jerry Handspicker, my teacher at Andover Newton Theological School and the associate pastor, offered the ordaining prayer, which asked God to endow me with all manner of things for my ministry, and he seemed in deadly earnest. After forty years I now understand why. Jerry, ironically, also presided at the service of thanksgiving for my ministry when I retired 10 years ago, so he book-ended my three decades of active ministry. At the ordination we sang “Holy, holy, holy,” and “Be Thou My Vision.” My then girlfriend, now wife, Martha, made me a handsome set of liturgical stoles. Good food was served. There were probably grape leaves. There were no tongues of fire or other obvious signs and wonders, although the whole event was wondrous to me, and when the clergy laid their hands on me I felt an enormous weight, a feeling about ordination that has never entirely left me. I got to my first parish in rural Maine and realized soon enough that I didn’t know what I was doing, and that feeling has never entirely left me either. My first congregations (I had two) taught me how to be a minister every bit as much as seminary, and I will always be grateful to them. God blessed me throughout my ministry with wonderful saints of the church who encouraged and sustained me, and put up with me even when I was acting like a damn fool. Early in my ministry I refused all honoraria, and thereby offended nearly everyone that offered me one. I was shopping for clothes the week before my wedding, and the good Roman Catholic salesman at the haberdashery rang me up with a ten percent clergy discount. I tried to explain all the high-minded reasons I couldn’t accept it and watched his face fall. I called my mentor Fred Robie, the sage of Sanford, who simply said, “My Daddy taught me that when someone gives you something, you say ‘thank you.’” Lesson learned. Would that everything I needed to learn was that simple. Many of these grilling and barbecuing books contain recipes for a “secret sauce.” I have been noticing lately that the term “secret sauce” has migrated from its culinary context and is now being employed as a metaphor for that special something that makes things work properly. For example, I recently heard a journalist talking about “the secret sauce” that would create “a grand bargain” to overcome the Congressional budget impasse. Good luck with that. So I started to wonder, “ What’s the secret sauce of ministry?” If I had to come up with a simple recipe for what makes ministry faithful and effective what would it be? So here’s my recipe, which comes in two parts, which I hope you will take away with you today for your own ministry, whether lay or ordained. 1. The first part of the secret sauce is this: You can’t do it alone. Rebecca couldn’t have come to this day alone, and she can’t do her ministry alone. No one does it alone. How does one come to know God? And to love God? And to want to serve God? When I look out at this congregation I see so many here today who have helped to shape and influence Rebecca. I am reminded of the scripture from Hebrews we just heard that says we are “surrounded by a great cloud of witnesses.” The image is from the ancient stadium where the races were held, and the cloud of witnesses are the spectators who cheer the racers on. In addition to Martha and myself, are Rebecca’s brother Andrew and his wife, Jessica. Rebecca’s maternal grandparents, Art and Marianne Talis, are here. As are several assorted aunties, an uncle, and a cousin. These family members represent a great line going back through generations of Talises and Beers, Floyds and Laffoons, and, let me tell you, there is a lot of church in these families. We represent a great ecumenical melting pot, from the Greek Orthodox faith of Rebecca’s grandfather’s forbears, to the German Protestantism of her grandmother. My mother’s father, Bill Laffoon, a descendant of French Huguenots, was a deacon at his Congregational Church in Wichita, Kansas. His schooling ended with the 6th grade, but saw to it that his two daughters went to college during the height of the Depression. Granddaddy read his Bible every day, and his speech was sprinkled with scripture verses. So when I was growing up my mother also had a scripture for every occasion, I thought she was so wise, she’d say, “Sufficient unto the day is the evil thereof.” And, “Do not cast your pearls before swine.” When I went to seminary I discovered that they weren’t original with my mother, but came from Jesus in the Sermon on the Mount. Years later, Rebecca had the same experience at Yale when she learned where all my wise sayings came from. On the other side of the family, I think today also of Martha’s grandmother, Marta Beer, which in our family is a family name and not a beverage. My Martha is named after her. She raised three daughters by herself in wartime Germany, and was another great churchwoman. How proud she would be. This rich ecclesiastical family DNA has helped to shape and form Rebecca into a minister. They are all part of this congregation today, a part of the cloud of witnesses. But there’s more. For as grand as Rebecca’s family legacy of ministry is, and as important as family support and nurture is, family alone cannot make a minister. And so I look around this room and I see many people from Rebecca’s past, a number of the good people of the First Church of Christ in Pittsfield, where Rebecca was baptized and confirmed. I see some of her Sunday School teachers, youth group leaders, mentors and supporters, who have made the trip down here today from the Berkshires. And when I look around today I also see many other friends, Pittsfield neighbors, UCC and ecumenical colleagues, and folks from the Berkshire Association, who have been part of Rebecca’s life. I see some of her Wellesley College roommates up in the balcony. I see Yale classmates and New Haven friends, and, of course, all of you from Green’s Farms Church, members and staff, who have so warmly embraced Rebecca in your community, and are now such an important part of this most recent chapter in her life. There are others, too, I must mention, who are neither related to Rebecca nor have ever met her, who she knows from the books she loves and the scriptures she studies. Those many other witness, men and women of the church: prophets, apostles, martyrs, evangelists, theologians, reformers, writers and thinkers down through the ages. They are part of this great crowd, too. They were all witnesses to God, and to God’s vast love for us in Jesus Christ. So all of you here, and all the unseen but present, make up the great cloud of witnesses, who cheer us all on as we go about our several ministries, and especially cheer Rebecca on today. I thank God, for you and for them. So to take nothing away from Rebecca, who as you know, is a remarkable young woman and certainly gets much of the credit for us being here today, she hasn’t done it alone. Because this ministry business is a team sport, and I have just described to you just how really big the team is. Nobody gets to ministry alone, and nobody does ministry alone, because you can’t do it alone. So that’s the first part of the recipe for the secret sauce of ministry. 2. The second part of the recipe for the secret sauce of ministry is this: It’s not about you. To do ministry in the name of Jesus Christ you have to get out of your own way. And the disciples never quite understood what he was trying to teach them until after Easter. Their hopes had been dashed on Good Friday as they fled from him and his cross. But after Easter all those things he said made sense. He was showing them a way, a way of selflessness, of servant-hood, a way to be a person for others. To the Corinthians he wrote, “What we preach is not ourselves, but Jesus Christ as Lord and ourselves as your servants for Jesus’ sake (2 Cor. 4,5). And a couple of lines later in that same letter he wrote them, “We have this treasure in earthen vessels to show that the transcendent power belongs to God and not to us.” (2 Cor. 4:7). What was he trying to tell them about ministry? 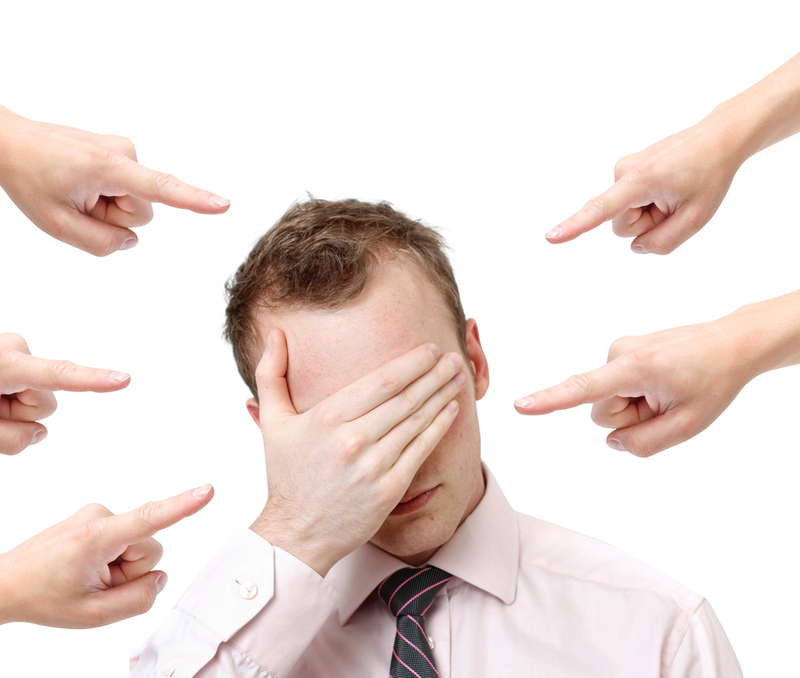 That “it’s not about you.” To be a minister you have to get out of your own way. And the reason that you have to get out of your own way is first to make space for God to work in and through you. And you have to get out of your own way, secondly, to make space for the other, the ones you minister to. And Mary demurred and said, “I really didn’t do that much.” And I thought she was just being humble. But as I started pondering the recipe for the secret sauce of ministry, I realized she was quite right. And you know why she was right? Because it wasn’t Mary who called Rebecca into the ministry. Mary was just doing her job, which is how ministry works. Rebecca was a questioning young woman in a pew in Cambridge, and Mary was doing her job, which was to share the God she knows and loves. And Rebecca was in the right time and the right place with the right person, and God’s Holy Spirit works like that, in what seems mundane, but can at the same time be quite marvelous. Our society cultivates a cult of personality, a cult of celebrity, but ministry is not about that. There are celebrity ministers, but the good ones, the faithful ones, know it is not about them. Not to be ministered to, but to minister. Not to be served but to serve. This is counter-cultural in our self-obsessed society. To tell people to get out of their own way for God and for others is not a particularly popular philosophy today. When I peruse the magazines at the super-market checkout there are titles such as Self, Us, People (meaning famous self-absorbed people) but I don’t see Servant or Ministry magazine. There was a fascinating interview with director Sofia Coppola in last Sunday’s New York Times about her new movie, The Bling Ring. The movie is based on a true story about five teenagers from the San Fernando Valley in California, who were so obsessed with the culture of personality and the trappings of celebrity that they started breaking into celebrity’s homes and stealing stuff. They would often just walk in through an unlocked front door, or climb in an open window. They robbed people like Lindsay Lohan and Paris Hilton. And that is a challenge for ministry these days. I am particularly thinking of parents and youth ministers. How do we raise our children in a society that tells them it really is all about us? Sunflowers do this because they are heliotropic; they need the sun to live. By analogy, we are theotropic, we need God to live, and we are made to bend our love toward God and others. But we too often bend our love toward ourselves, and that is where we get in trouble, for instead of living for God and others we try to love ourselves and control things as if we were God. And that is what is so beautiful about our second reading today from Philippians; it turns the equation entirely upside down. God in Christ bends toward us, and shows us what love looks like. Sin is for the creature to think and act as if it were the creator. But here in Philippians 2 Jesus is godlike precisely in going the other way. Here Jesus empties himself even of his divinity to become a servant, “a man for others” as Dietrich Bonheoffer described him. The church in Philippi was having one of those squabbles that have been known to happen in congregations, even in our own time. Paul admonishes them to get out of their own way, and have the very same mindset as Jesus, the mindset that led him to empty himself, and in humility take the form of a servant, the mindset that ultimately led to his death on the cross. But it’s not so easy to have the same mindset as Jesus. Remember those WWJD bracelets, that stood for “what would Jesus do?” Some people criticized those WWJD bracelets for being overly simplistic. Because asking, “What would Jesus do? doesn’t really solve the problem. It usually isn’t that hard to know what Jesus would do. People talk about the hard passages in the Bible, and there are some, but the parts that really challenge and convict me aren’t the parts I don’t understand, but the parts I do. “Love your enemies.” “Feed the hungry.” “Welcome the stranger.” “Share your possessions.” “Turn the other cheek.” “Take up your cross and follow me.” Just to name a few. So the hard part, after you figure out what Jesus would do, is doing it. To “practice what we preach,” to “walk the walk as well as talk the talk” is where we pretty consistently fail, and why we need grace and forgiveness to keep trying. And the good news is that is exactly what we get from our God, grace and forgiveness. In the cross of Jesus Christ, God does for us what we cannot do for ourselves, and saves us from ourselves, among other things, such as sin and death. All ministers, you and me, lay or ordained, even Rebecca, fail at being consistently Christ-like. But the wisest ministers know that our ministry is at its most faithful when we realize that it is not about us, when we get out of our own way, as Jesus did, to be a servant, as he was a servant, to serve as he served, to love as he loved, and to be a person for others. Because this self- emptying doesn’t mean we lose our personalities or our personal identities. On the contrary, when our love bends toward God and others, as those sunflowers bend toward the sun, when we lose ourselves in service, when we live for others, we are most ourselves, our own true best selves as God intended us to be. Just as Jesus’ exalted lordship is ultimately revealed in his humble servant-hood. 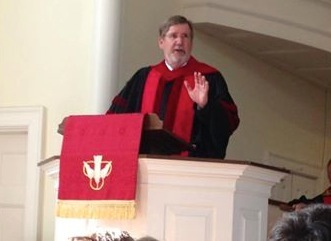 I preached this sermon at the Ordination of my daughter, Rebecca Megan Floyd, on June 9, 2013, at the Green’s Farms Congregational Church, UCC, in Westport, Connecticut. I was blessed during my several pastorates to have a number of clergy sitting in the pews. Some were retired, some were pastoral counselors, and several were seminary professors from nearby schools. With very few exceptions these colleagues were always encouraging and supportive, and I valued their comments, conversation and friendship. 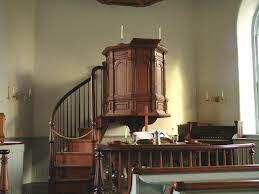 Now I am a pew sitter myself for the most part, except for the odd pulpit supply invitation. I enjoy hearing a good sermon and have been blessed to hear many in recent years. But not everyone finds the presence of clergy in the pews a blessing (see cartoon above). I have active colleagues who tell me that some of their retired clergy colleagues can be a burden to them, that they know they will be critical of them and they make them nervous. 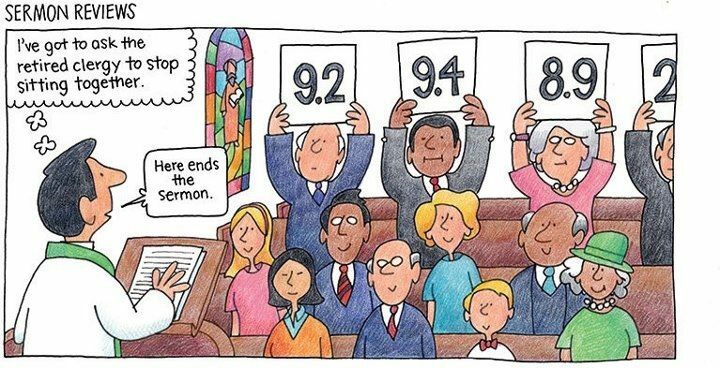 When this happens it is a failure of a basic kind of collegiality that should prevail among the ordained clergy, the ministry of encouragement. Our role as pew sitters is to support our pastors. We of all people know the nature of the job. And out of that knowledge should come from us a great measure of appreciation for all they have to do. We should be praying for them regularly. We were once where they are and were blessed with elder teachers, mentors, and friends. I have learned these past few years that it is a difficult transition to go from being regularly in the pulpit for decades to finding oneself in the new role of congregant. It takes patience and humility. But the thing we retired clergy have in common with the one who now leads our community in worship is worship itself, and the reality that pastor and people stand under the Word of God, and the grace and love that is proclaimed in it. And there is a blessing in being a worshipper without the responsibility of presiding, a chance to open oneself to God’s presence and power without having to wonder if the absent-minded reader will find the right lesson or whether the kids will be so sugared up that they will hijack your children’s message.